Anyone who’s taken the SATs knows how much every minute counts during the test. 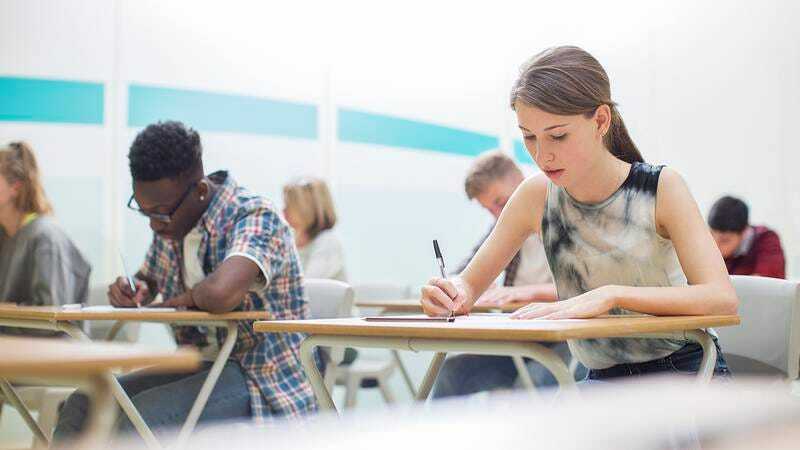 Even minor distractions can mean the difference between an average score and a 1600. Luckily for today’s students, the one organization that can do something about it is cutting test-takers some slack in a major way: College Board will now add 50 points to your SAT score if a school shooting happens during your test. Looks like College Board is finally catching up with the times! Starting this spring, College Board will apply 50 points to the overall score of anyone whose test sessions are interrupted by one or more active gunmen, no matter which portion of the exam the school shooting occurs during. Now, if you have to allocate any precious test time to shut the lights off, hit the floor, and stay as quiet as possible until a SWAT team contains the situation, you can rest easy knowing you’ve got 50 free points coming your way to make up for it. Thanks to this new scoring policy, the days of working through the sound of automatic rounds popping off down the hallway until you’ve answered every question on the math section are officially a thing of the past. Yup, you can bet that any kid stressing that a fellow student with an undiagnosed mental illness and access to weapons will storm the school during the SAT session just let out a huge sigh of relief. Without a doubt, College Board just proved it’s far more in touch with the needs of the modern student than people give it credit for. The SATs are already stressful enough for college-bound students without an active shooter bursting into their classroom mid-test, so it’s truly awesome to see College Board implement changes that let them worry about exam day that much less. Kudos to them! We’ve got our fingers crossed that this helps a lot more kids earn perfect scores this year!